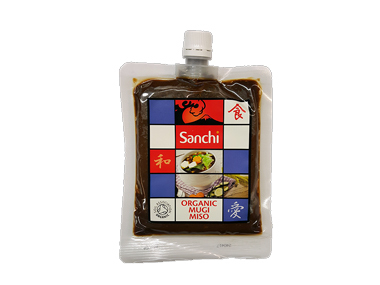 Buy Sanchi Organic Mugi Miso Paste - 200g in the UK from our online shop or directly from our independent Scottish store. Aged in wooden kegs over 18 months Mugi Miso has a rich, savoury taste suitable as a rich seasoning base for soups, stews, casseroles, dips, spreads and sauces. Organic Mugi Miso is widely used in Japanese cooking. Organic Soya Beans (37%), Organic Barley (gluten) (31%), Water, Sea Salt. We sell real Sanchi and other Miso & Miso Products directly from our shop in Scotland and online throughout the UK. View more products from Sanchi. Where can you buy real Organic Mugi Miso safely online? If you are wondering where you can buy Sanchi Organic Mugi Miso Paste - 200g safely online in the UK, then shop with us. We are an actual health foods shop; with real people selling real foods and products. Our award-winning independent shop is located in Stirling, Scotland since 1976. You can buy our Miso & Miso Products in store or safely place an order with us online or over the phone. Organic Mugi Miso - Sanchi Organic Mugi Miso Paste - 200g in Miso & Miso Products and Miscelanious Ingredients.